Every "brand" is, by definition, just a collection of ideas and expectations in the eyes of the consumer. Companies try hard to craft how people think about their brands through the products and services they offer, the marketing they use, and the actions they take as a company. Unfortunately, customers are also creating their own version of the brand based on their expectations and interpretations. When these two clash, the result is often disappointment and lost customers. Why do people follow you in the first place? Every company should answer this question, or at least the variant - "Why SHOULD people follow us? ", before they even create their social accounts.. Later on, using detailed content interaction analysis and talking to the community, companies should make sure that they are in sync with reality. Brand Enthusiasm (16%) - they love the brand and want to signify that. Deals (15%) - they want to save money on the products that companies have to offer. Product News (12%) - they want to know what is happening with new products and services. Very few people become fans because they share interesting content (8%) or want to give feedback (4%). Frequency - How often will they see the brand content? Once an hour, once a day, once a week? Direction - Does the brand just broadcast content or does it want the fan to discuss and engage? Support - Will the brand handle questions and issues on social media? How quickly? Blend - How much of the brand's content will be about itself versus general topics? There isn't a general "right" answer to the questions above - it is entirely defined by what the brand followers expect from that brand. They may have an entirely different set of expectations from the 10 other brands they follow. For example, one user might follow Audi because he loves his car, but never want to see a single post from them. He isn't going to engage with content he does see and if he does see content, he wants it to be about his car. He will call his dealer for support. On the other hand, he might also follow Mashable and expect to see hourly content about current events where he will give his opinion and not expect support. This means that all the posts that say - "too much promotional content will push away your fan" - can be completely wrong for your brand. Notice that brands can post both too much or too little. That they can be too focused on themselves or not enough. A potential problem with this data is the same one that plagues political polls - asking people why they WOULD do something doesn't get the same answers as why they DID do something. Regardless, it still offers proof of the importance of meeting expectations. Additionally, whatever reason they had for following the brand in the first place doesn't mean that they still feel that way now. That can be a real problem if your brand is trying to offer interesting content to people who just want deals or who actually don't want to see anything anymore. You can see the huge disconnect - people feel like Utilities are incrediblly unresponsive when they are in fact the most responsive. They also feel like Media/Entertainment is very responsive, when they are not at all. So, what can you do today to help retain your current and future followers? Answer the question. 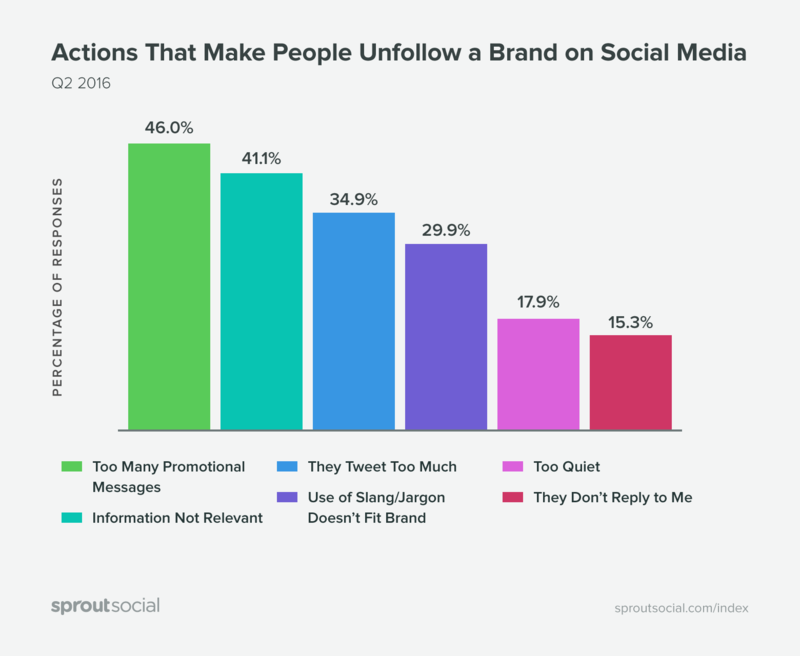 Why should people follow your brand? What value are you offering and who are you expecting to offer it to? Look at the current data. Who actually are your followers and who are the ones that are actively engaging? Do they match what you answered in #1? Survey your audience. What are their expectations for frequency, direction, support, and blend? Do they match what you answered in #1? Make some changes. Use the data to adjust your content and conversation plans. Make small, testable changes that build on each other. Then start the process over again in 6 months and see how things have changed. Creating a regular process of evaluation and change will make a huge difference in how effective your brand is in retaining followers, driving engagement, and building long lasting customer relationships. 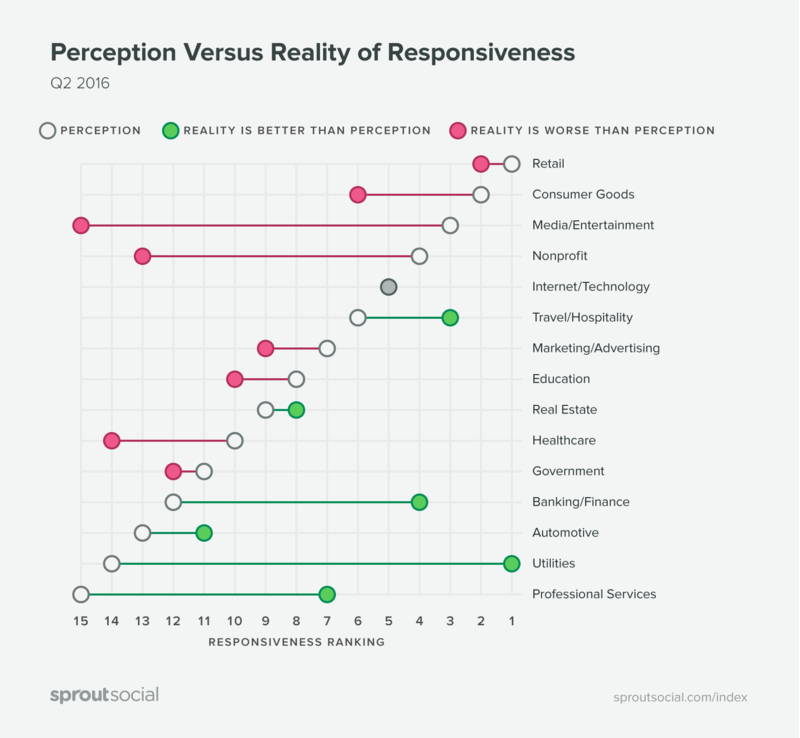 Does your brand meet your followers' expectations?